The World Series Champions are welcomed by the President of the United States. It was standing room only at the White House Monday as President Barack Obama welcomed the World Series Champion San Francisco Giants. The stage was packed as was the seating area. Willie Mays just may have gotten a louder ovation that the Commander in Chief. He acknowledged Tim Lincecum's Cy Young and he joked about Brian Wilson's earlier spandex outfit at the Espy's. "And I do think, Brian, you should know that Michelle was very relieved that the press was going to be talking about what somebody else wears here in the White House – so that it’s not just her making a fashion statement," Obama added. "So even though this team is a little different -- even though these players haven’t always followed the traditional rules, one thing they know is how to win. Maybe some of that wisdom comes from all the old-time greats who never won a Series, but know that being a Giant means being a Giant for life. And that’s why greats like Willie McCovey can often be found hanging around the clubhouse, pulling young players aside and offering them hitting tips." . The president said the Giants was a team of "characters with character" and he wished them the best of luck for the rest of the season "unless the White Sox get in" to the World Series. The event was also a who's who in San Francisco politics. 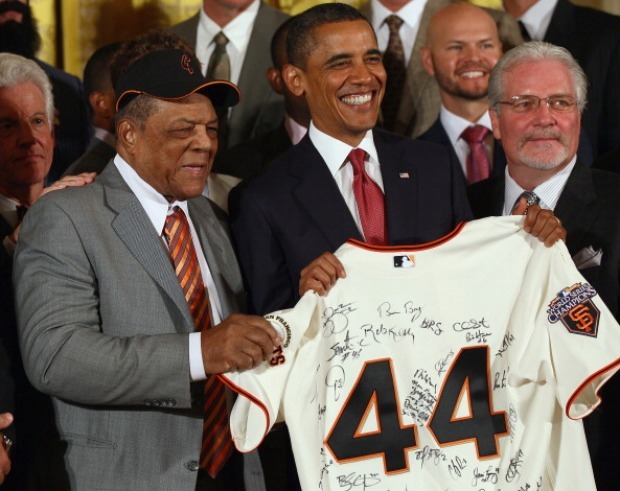 Giants presented the president a jersey, a bat and a glove (so he should be all set.) The president gave them his congratulations. The team took a red-eye to D.C. after their rubber match win against Milwaukee Sunday at AT&T Park. A memo in the clubhouse instructed everyone to bring a coat and tie for the meet and greet; no spandex allowed. Everyone played nice and dressed in their Sunday best. Monday was supposed to be an off day, but instead turned into a bit of political theater. The Giants were in the general D.C. area and to play in Philadelphia Phillies Tuesday night. After they posed for photos, the team took a train to Philly. They left 1600 Pennsylvania Ave. with yet another World Series honor for their memory bank and their photo album.